The forecast for tomorrow is 16 degrees with rain all day, a sure sign that autumn is right around the corner. Today, however, was a scorching 27 degrees. The Baberoo and I took advantage of summer’s last hurrah by visiting the University of Oxford Botanic Garden (Rose Lane, OX1 4AZ). 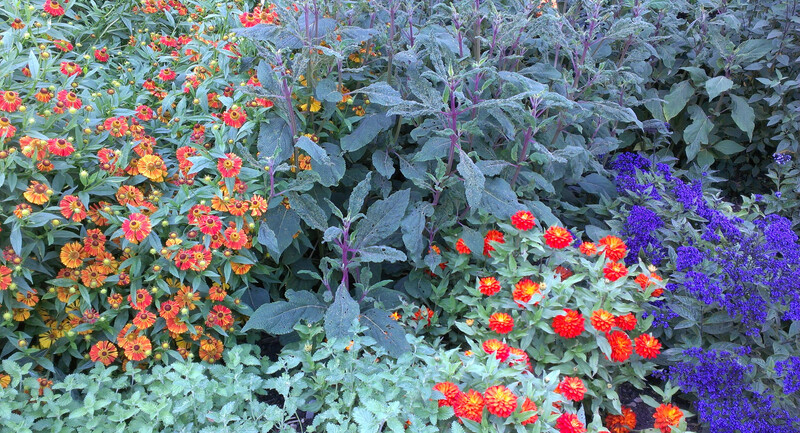 We’ve been big fans of the botanic garden since the Baberoo was only three months old. I first took her there at the end of March, when the hellebores were nearly the only thing blooming and the rain and my baby-induced sleeplessness made it seem as if the winter would never end. We’ve been going back ever since on our annual pass, which is the best £15.50 I’ve ever spent (and it gets you into Harcourt Arboretum too!). Every few weeks we’ve gone back to see the changes in the botanical season, from tulips to peonies to dahlias. And that’s only the herbaceous borders: there’s also a fabulous vegetable garden, fruit trees, seven glasshouses, a rock garden, a bog garden, and the new Merton Borders, which feature an ornamental, environmentally sustainable display using direct sowing of seeds. 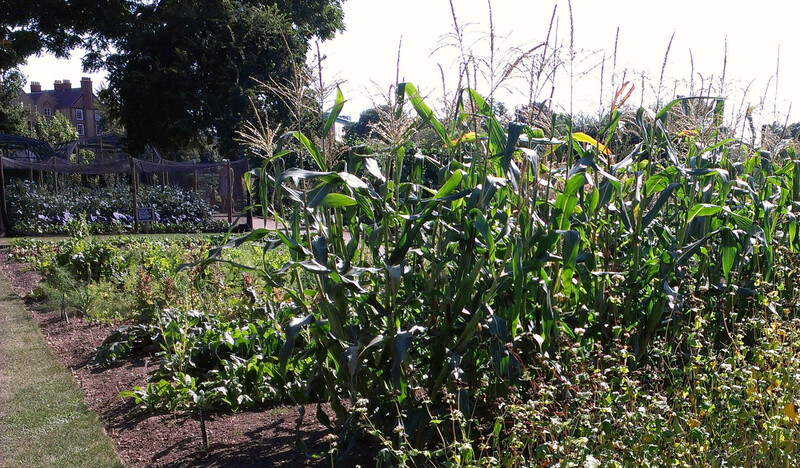 Today the vegetable garden was a pretty amazing sight, with corn, beans, rhubarb, and squash all looking like they were at their peak (we missed the giant pumpkin, though, as I discovered to my chagrin when we got home). 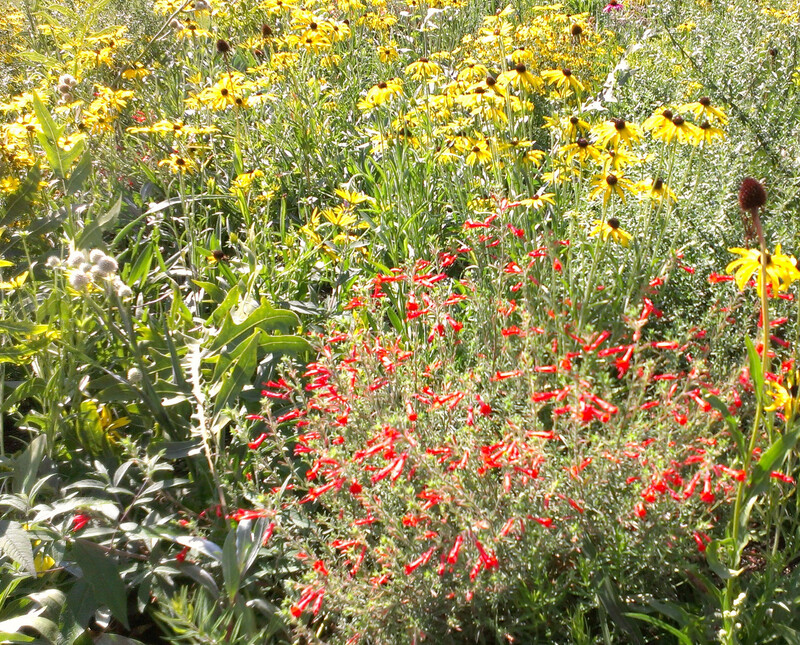 The Merton Borders were full of bees (a good thing!) and blooming splendidly; I remember seeing the area in March and there was nearly nothing in it. I can’t believe it’s the same garden! 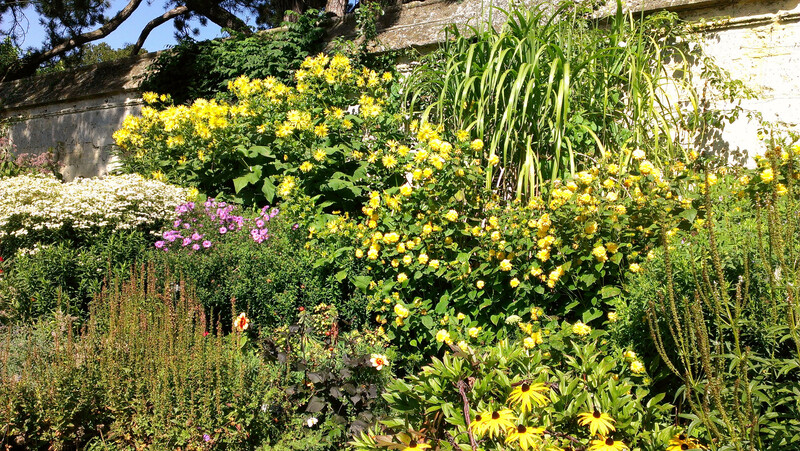 There was some riotous colour in the herbaceous borders, and the bog garden – where we sat for an alfresco lunch – was so lush that you could hardly see the water for all the plants. Not only is the botanic garden a treat for all the senses, it’s baby-friendly too. Here’s how it stacks up against my four criteria for baby-friendliness (space, ambiance, facilities, and feeding – see my About page for a full explanation of my criteria for rating attractions that aren’t eateries). Space: There’s an entrance for prams and wheelchairs at the side of the garden on Rose Lane. There’s plenty of space in the two outdoor gardens (the Walled Garden and the Lower Garden), so you can wheel your baby carriage around as much as you like. It’s a bit more difficult getting into the glasshouses; the conservatory (which houses the citrus plants) has plenty of room inside but it’s difficult to get in the doors; usually I need someone to help me because you need to open both doors to fit a stroller in. Happily, today they were already open because of the hot weather. The other glasshouses are more difficult; a larger pram might not fit the width of the very narrow corridors (especially since there are huge plants coming at you from either side), and if you do fit, there’s no chance of anyone being able to pass your carriage in the space so you might have to do some backing up. The rose garden facing the High Street isn’t accessible to strollers unless you have wheels that can roll on gravel; mine can’t. To be fair, I don’t think that this is actually part of the University of Oxford Botanic Garden so isn’t managed by them – but when you’re going for the experience of a garden, you don’t care about technicalities like this: you just want to see the roses! Ambiance: Couldn’t be nicer, at any time of the year. Whenever I visit I marvel at how quickly things change and how beautiful each season is. The staff at the reception are very welcoming and helpful, and so are the garden staff if you happen to meet any of them working outside. Even the ducks are friendly! 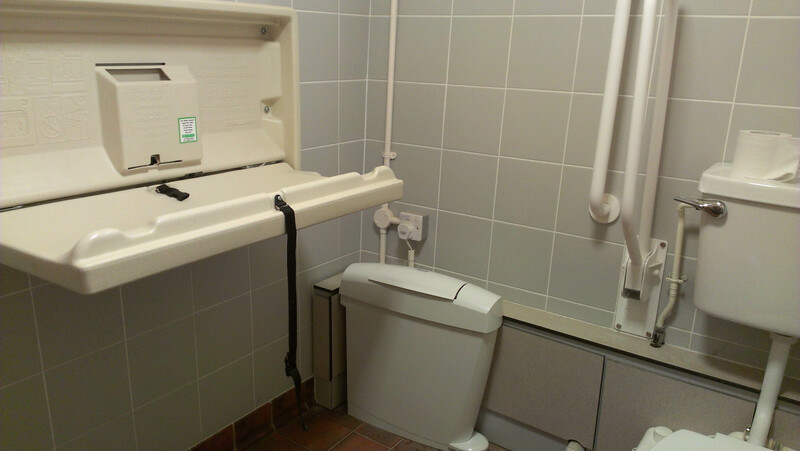 Facilities: There is a baby-changing facility in the disabled toilet. It’s spacious and has a pull-down changing table. It’s clean and presentable, although there’s no place to put your changing bag. Feeding: There are plenty of benches to sit on throughout the garden, but you can also bring a blanket and sit on the grass with your baby. We dined alfresco on a bench today (with regular food, although I’d have been happy to breastfeed as well). If you go in the winter it might be too cold for breastfeeding, though! As an attraction, the Botanic Garden is a wonderful resource and a haven of peace and quiet away from the crowds in the city centre, and a perfect place to bring your baby to relax. I give it a 7.0 out of 8. If you love gardens, treat yourself to an annual pass and go throughout the year.